Introducing Delight XR banner ads - A powerful new tool that takes your VR and 360 content monetization to the next level. New types of banner advertisements can now be placed non-intrusively around the user interface of Delight XR. We support all regular ad networks and even your custom-made setups. All this comes without additional costs - keep 100% of your ad revenue. In video advertisement, every impression counts - deliver our new exciting ad format across all platforms to maximize your reach. 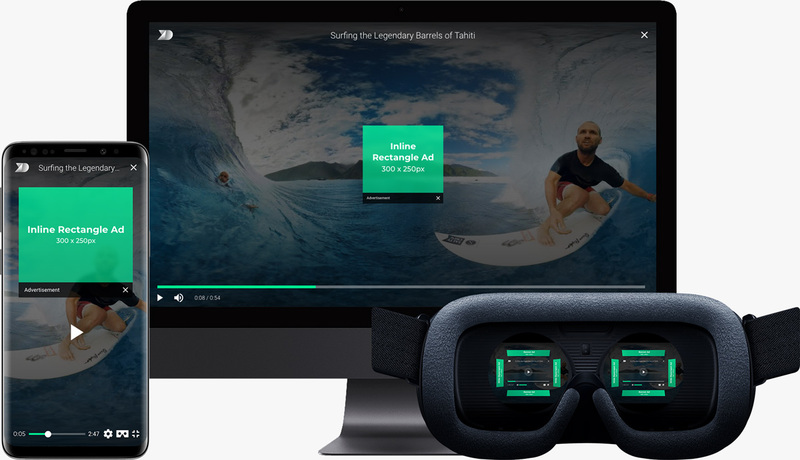 Choose between well-established centered pause spots on Mobile and Desktop (300px by 250px) and four new exciting VR spots that are located non-intrusively around the user interface. In VR you can choose between “Banners” (468px by 60px) and “Wide Skyscrapers” (160px by 600px). The choice is yours - Seamlessly integrate any kind of ad server of your liking - or simply serve banner ads from any http-address you want. Flexible and reliable in proven Delight VR quality. Take a closer look at how we could help you monetize your content. To view the banner ad simply press pause during regular playback. Press the VR button in the bottom right corner to toggle the controls.